Brenham ISD recently received a $4,000 donation from H-E-B. 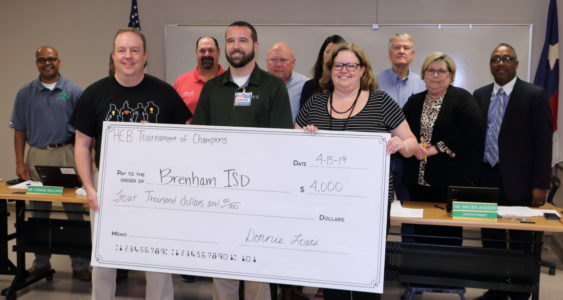 At the school board’s meeting Monday, the H-E-B Tournament of Champions Charitable Trust (H-E-B TOC) presented a $4,000 check to the school district. The funds will be given to the Alton Elementary School campus and the Brenham ISD Education Foundation. A quarter of the donation will be distributed to Alton Elementary to purchase books for the upcoming Alton Book Festival, to be held May 21st. The remaining donation will go to the Education Foundation, who will use the funds for its mini-grant program this fall. H-E-B TOC provides an opportunity for H-E-B partners, suppliers, and vendors to join together and make an impact for nonprofits that are focused on meeting the needs of children and families throughout the state.